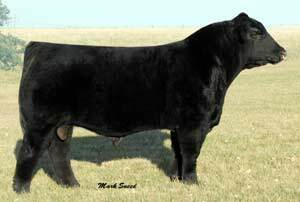 Premium Blend was the high selling bull at the 2007 DeRouchey CC Bull Sale. He was named the Champion Bull at the American Royal and Reserve Champion Bull at the 2007 NAILE, KY. He is extra stout boned and cool profiled with plenty of body depth and exemplary muscle shape.